Lambda provides retained austenite measurement using x-ray diffraction. X-ray diffraction is considered to be the most accurate method of determining the amount of retained austenite in steels. Lambda is the only accredited independent laboratory that uses Bragg-Brentano diffractometers for measurement of retained austenite, in accordance with ASTM and SAE. Austenite measurement method of Averbach and Cohen and Bragg-Brentano diffractometers in strict adherence to SAE SP-453 and ASTM E975. R-values are calculated from first principals for each steel alloy tested per SAE SP-453. -The volume percent austenite can be determined in layers as thin as 10 microns. Measurements can be made nondestructively on the surface of critical components. Miller apparatus is available to spin and rock the sample to mitigate texture and grain size effects. Subsurface austenite distributions may be obtained through the hardened case using electropolishing. Complete machine shop for sample sectioning and preparation, including wet cut-off saw, wet diamond saw, and wet mechanical polishing or sanding. Carbides present are routinely identified, and specific data collection schemes are developed for each alloy to avoid and correct for carbide interference. Carbide content may be obtained by chemical extraction and gravimetric analysis. Correction for carbide content is available. Either constant angle or constant area techniques allow measurement of arbitrary sizes and shapes. Fixtures are available for large samples. How Does Retained Austenite Affect Performance? Hardening of steels requires heating to an austenitic phase and quenching to room temperature to produce a hard martensitic phase. Due to incomplete transformation some austenite is retained at room temperature. 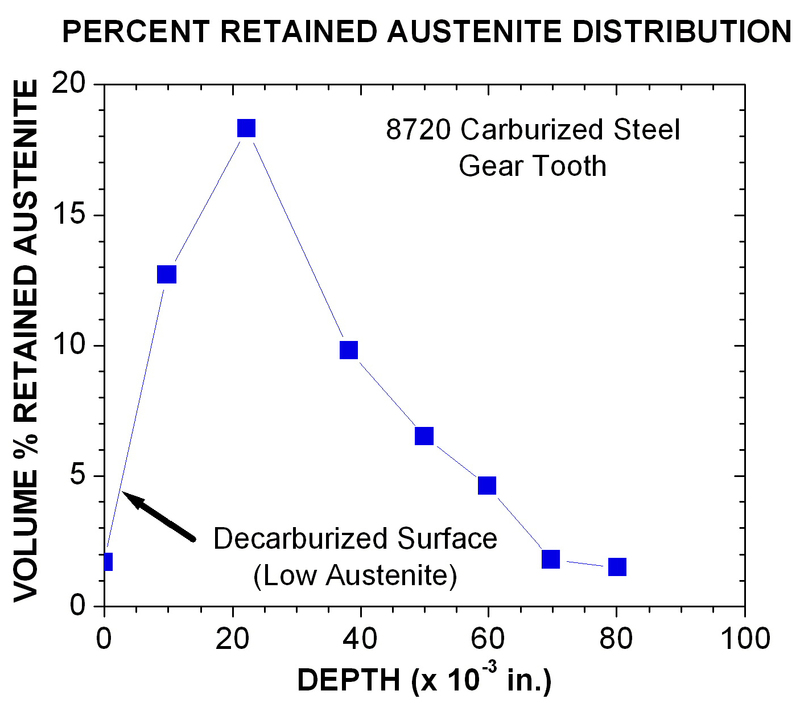 Retained austenite can have a detrimental affect on the mechanical properties of the steel. Properties such as fatigue strength, toughness, hardness, yield strength and machinability can be influenced by retained austenite. Austenite can transform in service as a result of thermal cycles, plastic deformation, or shock. Shot peening, for example, will transform the retained austenite on the surface of gear teeth. Exposure to extreme cold renders the retained austenite increasingly unstable as the temperature diminishes. The transformation of austenite to ferrite involves a nominal 4% volume increase that can lead to seizure and excessive interference in precision gearing and bearings. It is important to characterize the retained austenite to ensure safe operation of certain critical pieces. Most of the diffractometers on the market today are equipped with position sensitive detector (PSD) based systems for speed and portability. These systems cannot be calibrated by direct calculation of the relative phase intensities and must use reference standards that usually are not of the same structure as the test articles. For the reasons described above, any difference in unit cell dimension between the calibrating austenite standard and the test article will result in a significant error in calibration of the measurement system. It is therefore critical that the reference standards are of the same alloy and structure as the samples being tested on PSD based systems. Lambda can provide rigorous certification of retained austenite standards per ASTM and SAE. Standards can be manufactured from the same structure and alloy as the test article to eliminate the associated errors discussed above. 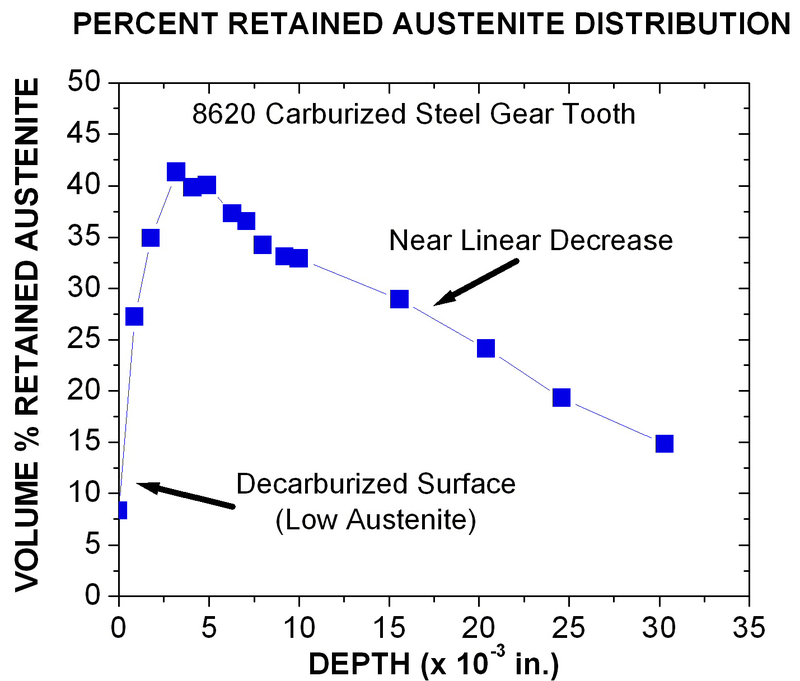 For more information on Retained Austenite Measurement, see Lambda Research Diffraction Notes, No. 4 or No. 33. For any questions you have about our austenite testing facilities or to send samples please contact us now at (800) 883-0851 or by email.